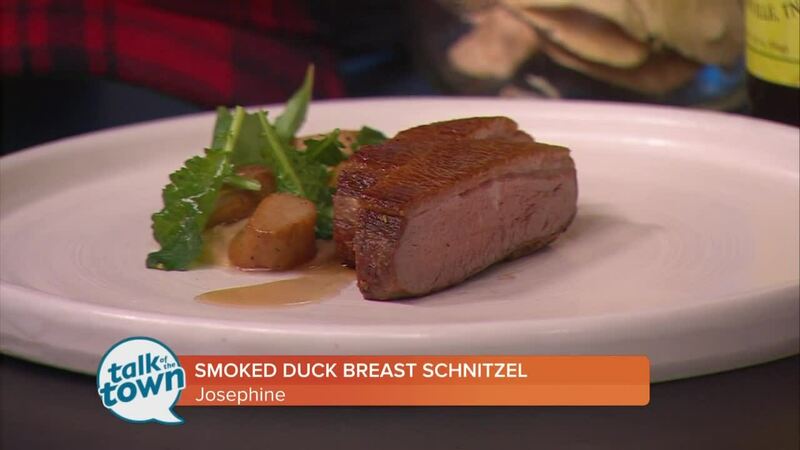 Chef Andy Little from Josephine made Roasted Wedge Oak Duck Breast with Smoked Apple Schnitz, Horseradish, Mushrooms and Hickory Syrup. (see recipe below) Join renowned Nashville Chefs Andy Little of Josephine and Chef Maneet Chauhan of Chauhan Ale & Masala House, Tànsuŏ, The Mockingbird and Chaatable for a special dinner in support of Second Harvest Food Bank Middle Tennessee. The event is Sunday, January 20 at 7pm at Josephine, located at 2316 12th Avenue South, Nashville, TN 37204. Get more information and reserve tickets here: https://www.eventbrite.com/e/chefs-maneet-chauhan-and-andy-little-live-at-josephine-tickets-54554285336 . Film a heavy bottom sauté pan with the duck fat. Season the duck skin with salt and pepper and place in the pan, skin side down. Roast until the skin is nice and crispy, about 8 minutes. Flip the duck over, add the thyme and garlic and baste the skin side of the duck. Cook another 4 minutes and remove from the pan to rest. In a saucepan, bring the chicken stock to a simmer and add the apples, horseradish and thyme. Simmer until the apples are very soft. Add all contents to a blender and blend until smooth. Film a heavy bottomed sauté pan with duck fat. Once the fat is hot, add the mushrooms and roast for about 4 minutes. When you have achieved nice color, add the thyme and clove and spoon the fat over the mushrooms. Remove to a clean towel to remove excess duck fat. Combine in a small bowl and reserve for finish plating.